It is yet to open for business, but the public debut of the latest addition to Hull’s skyline has already elevated the status and credentials of a key sector of the region’s economy. Unfinished it may be, but the glittering Centre for Digital Innovation (C4DI), which has risen rapidly in the Fruit Market creative quarter, was the perfect venue for the first Hull and East Yorkshire Digital Awards. Hull-based developer Wykeland Group pulled out all the stops to make C4DI available to event organisers the Hull Daily Mail and KC and showcase the building as the new heart of the region’s thriving digital and technology sector. And no one in attendance could have been left in any doubt that this was a landmark occasion – an inspirational evening that confirmed Hull and East Yorkshire’s credentials as a digital hotspot, staged in a building that stands as a beacon of the region’s tech ambitions. As the centrepiece of Wykeland’s £15m @TheDock development, C4DI will provide a prominent focus for the region’s fast-growing digital economy, with facilities and connectivity to rival tech centres across the UK and beyond. Indeed, the event host, BBC Technology Correspondent Rory Cellan-Jones, said with C4DI the region’s hub of digital innovation, the area was set for tech take-off, with the potential for world-class businesses to emerge. The awards evening saw business leaders welcomed into C4DI to celebrate the region’s very best exponents of digital technology. The highlight of the evening was a popular award for one of the key figures behind C4DI, who was recognised both for his role in driving forward the tech hub and his contribution to one of the region’s most successful digital businesses. 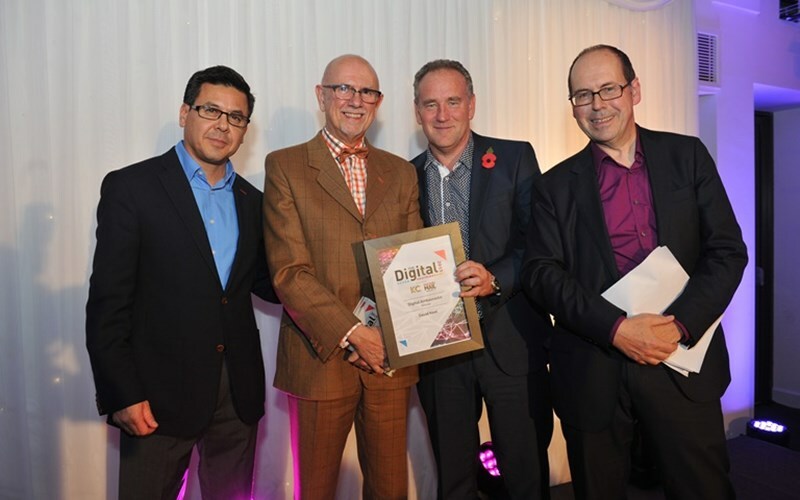 David Keel, Global Innovations Director of Hull-based digital brand management company Trident and Chair of C4DI, received the Digital Ambassador of the Year Award, presented by KC Managing Director Gary Young. Mr Young paid tribute to Mr Keel’s pivotal role in the remarkable growth of Trident, from just five employees in Hull to more than 600 staff worldwide, in a business generating £65m in turnover from many of the world’s biggest consumer goods companies. Mr Young also praised Mr Keel’s “passion and energy for all things digital” and leadership in the development of C4DI. “This iconic building, and the talent within it, will put our region well and truly on the map for digital enterprise and excellence,” said Mr Young. Trident also claimed the Best Global Reach award in recognition of its extraordinary worldwide growth, while other major winners on the night included Willerby-based digital marketing specialist Summit Media, which claimed the Best E-commerce and Best Digital Innovation awards. Exciting digital start-ups were also recognised, with 19-year-old Hull entrepreneur Alex Youden of NFire Labs, which has developed the world’s first modular 3D printer, taking both the Young Digital Person and Best Hardware award. Rory Cellan-Jones highlighted a further advantage for the region – KC’s “cutting-edge” ultrafast fibre broadband network, which he said provided “lightning-fast connectivity” to power the growth of both tech start-ups and established businesses. And Mr Young told guests that KC’s Lightstream fibre rollout was contributing to the Government’s newly-stated ambition for ultrafast broadband – offering speeds of a minimum of 100 megabits per second – to be available across Britain. He added: “We are very proud of the part we are playing in establishing the area’s reputation as a leading hub for digital technology and enterprise. Availability of Lightstream is one of the key attractions of C4DI, which offers fully managed office space for digital and tech businesses as well as hotdesk facilities for start-ups and freelancers. With two floors of offices at C4DI let in advance of opening in mid-November, as well as scores of hotdesk subscribers and many of the area’s most successful companies as corporate members, Mr Keel said the development’s popularity had justified the “build it and they will come” approach.